14 · Life Support [Star Trek] · John Sayers · sa [Ronald D. Moore; Christian Ford; Roger Soffer]; adapted from the teleplay by Ronald D. Moore, story by Christian Ford & Roger Soffer. 43 · Heart of Stone [Star Trek] · John Sayers · sa [Robert Hewitt Wolfe]; adapted from the teleplay by Robert Hewitt Wolfe. 49 · Destiny [Star Trek] · John Sayers · sa [David S. Cohen; Martin A. Winer]; adapted from the teleplay by David S. Cohen & Martin A. Winer. 54 · Prophet Motive [Star Trek] · John Sayers · sa [Robert Hewitt Wolfe]; adapted from the teleplay by Robert Hewitt Wolfe. 61 · Visionary [Star Trek] · John Sayers · sa [John Shirley; Ethan H. Calk]; adapted from the teleplay by John Shirley, story by Ethan H. Calk. 14 · Distant Voices [Star Trek] · John Sayers · sa [Ira Steven Behr; Robert Hewitt Wolfe; Joe Menosky]; adapted from the teleplay by Ira Steven Behr & Robert Hewitt Wolfe, story by Joe Menosky. 19 · Through the Looking Glass [Star Trek] · John Sayers · sa [Robert Hewitt Wolfe]; adapted from the teleplay by Robert Hewitt Wolfe. 27 · Improbable Cause [Star Trek] · John Sayers · sa [René Echevarria; Robert Lederman; David R. Long]; adapted from the teleplay by René Echevarria, story by Robert Lederman & David R. Long. 31 · The Die Is Cast [Star Trek] · John Sayers · sa [Ronald D. Moore]; adapted from the teleplay by Ronald D. Moore. 36 · Explorers [Star Trek] · John Sayers · sa [René Echevarria; Hilary J. Bader]; adapted from the teleplay by René Echevarria, story by Hilary J. Bader. 41 · Family Business [Star Trek] · John Sayers · sa [Robert Hewitt Wolfe]; adapted from the teleplay by Robert Hewitt Wolfe. 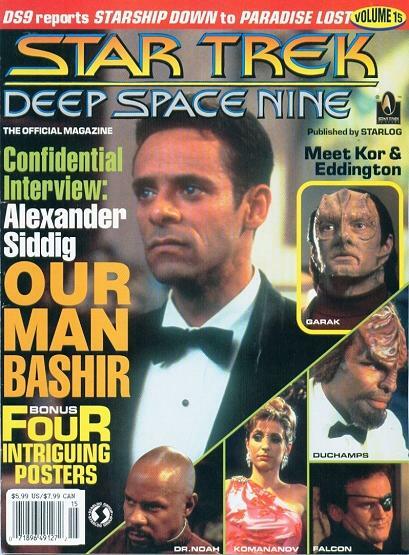 52 · Shakaar [Star Trek] · John Sayers · sa [Gordon Dawson]; adapted from the teleplay by Gordon Dawson. 56 · Facets [Star Trek] · John Sayers · sa [René Echevarria]; adapted from the teleplay by René Echevarria. 61 · The Adversary [Star Trek] · John Sayers · sa [Robert Hewitt Wolfe]; adapted from the teleplay by Robert Hewitt Wolfe. 12 · The Way of the Warrior [Star Trek] · John Sayers · sa [Ira Steven Behr; Robert Hewitt Wolfe]; adapted from the teleplay by Ira Steven Behr & Robert Hewitt Wolfe. 23 · The Visitor [Star Trek] · John Sayers · sa [Michael Taylor]; adapted from the teleplay by Michael Taylor. 44 · Hippocratic Oath [Star Trek] · John Sayers · sa [Lisa Klink; Nicholas Corea]; adapted from the teleplay by Lisa Klink, story by Nicholas Corea & Lisa Klink. 50 · Indiscretion [Star Trek] · John Sayers · sa [Nicholas Corea; Toni Marberry; Jack Treviño]; adapted from the teleplay by Nicholas Corea, story by Toni Marberry & Jack Treviño. 56 · Rejoined [Star Trek] · John Sayers · sa [Ronald D. Moore; René Echevarria]; adapted from the teleplay by Ronald D. Moore & René Echevarria, story by René Echevarria. 61 · Little Green Men [Star Trek] · John Sayers · sa [Ira Steven Behr; Robert Hewitt Wolfe; Toni Marberry; Jack Treviño]; adapted from the teleplay by Ira Steven Behr & Robert Hewitt Wolfe, story by Toni Marberry & Jack Treviño. 6 · Starship Down [Star Trek] · John Sayers · sa [David Mack; John J. Ordover]; adapted from the teleplay by David Mack & John J. Ordover. 11 · The Sword of Kahless [Star Trek] · John Sayers · sa [Hans Beimler; Richard Danus]; adapted from the teleplay by Hans Beimler, story by Richard Danus. 43 · Our Man Bashir [Star Trek] · John Sayers · sa [Ronald D. Moore; Robert Gillan]; adapted from the teleplay by Ronald D. Moore, story by Robert Gillan. 57 · Homefront [Star Trek] · John Sayers · sa [Ira Steven Behr; Robert Hewitt Wolfe]; adapted from the teleplay by Ira Steven Behr & Robert Hewitt Wolfe. 61 · Paradise Lost [Star Trek] · John Sayers · sa [Ira Steven Behr; Hans Beimler; Ronald D. Moore]; adapted from the teleplay by Ira Steven Behr & Hans Beimler, story by Ronald D. Moore. 8 · Crossfire [Star Trek] · John Sayers · sa [René Echevarria]; adapted from the teleplay by René Echevarria. 14 · Return to Grace [Star Trek] · John Sayers · sa [Hans Beimler; Tom Benko]; adapted from the teleplay by Hans Beimler, story by Tom Benko. 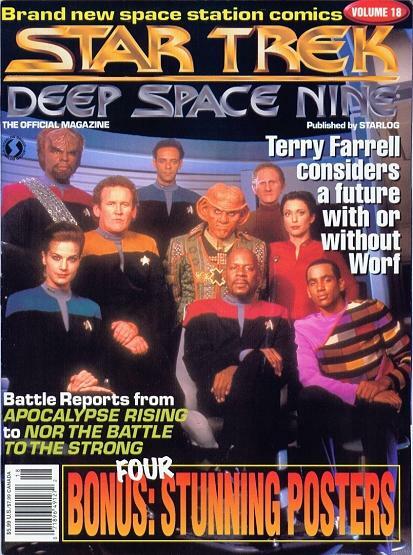 50 · Sons of Mogh [Star Trek] · John Sayers · sa [Ronald D. Moore]; adapted from the teleplay by Ronald D. Moore. 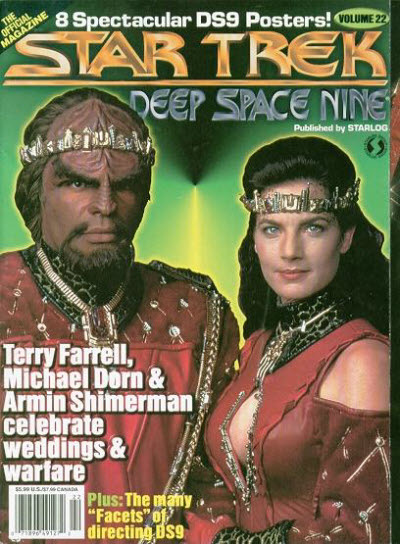 56 · Bar Association [Star Trek] · John Sayers · sa [Robert Hewitt Wolfe; Ira Steven Behr; Barbara J. Lee; Jenifer A. Lee]; adapted from the teleplay by Robert Hewitt Wolfe & Ira Steven Behr, story by Barbara J. Lee & Jenifer A. Lee. 62 · Accession [Star Trek] · John Sayers · sa [Jane Espenson]; adapted from the teleplay by Jane Espenson. 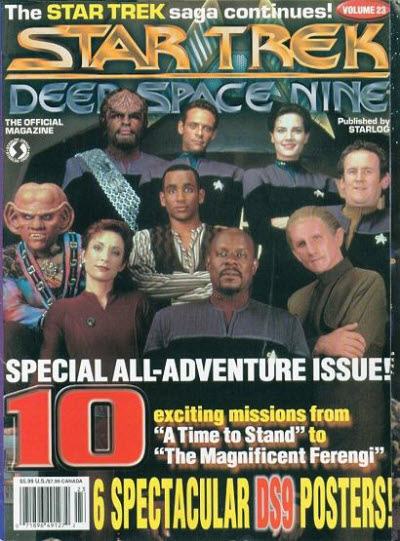 10 · Rules of Engagement [Star Trek] · John Sayers · sa [Ronald D. Moore; Bradley Thompson; David Weddle]; adapted from the teleplay by Ronald D. Moore, story by Bradley Thompson & David Weddle. 15 · Hard Time [Star Trek] · John Sayers · sa [Robert Hewitt Wolfe; Daniel Keys Moran; Lynn Barker]; adapted from the teleplay by Robert Hewitt Wolfe, story by Daniel Keys Moran & Lynn Barker. 20 · Shattered Mirror [Star Trek] · John Sayers · sa [Ira Steven Behr; Hans Beimler]; adapted from the teleplay by Ira Steven Behr & Hans Beimler. 26 · The Muse [Star Trek] · John Sayers · sa [René Echevarria; Majel Barrett Roddenberry]; adapted from the teleplay by René Echevarria, story by René Echevarria & Majel Barrett Roddenberry. 39 · For the Cause [Star Trek] · John Sayers · sa [Ronald D. Moore; Mark Gehred-OConnell]; adapted from the teleplay by Ronald D. Moore, story by Mark Gehred-OConnell. 44 · To the Death [Star Trek] · John Sayers · sa [Ira Steven Behr; Robert Hewitt Wolfe]; adapted from the teleplay by Ira Steven Behr & Robert Hewitt Wolfe. 51 · The Quickening [Star Trek] · John Sayers · sa [Naren Shankar]; adapted from the teleplay by Naren Shankar. 56 · Body Parts [Star Trek] · John Sayers · sa [Hans Beimler; Louis P. DeSantis; Robert J. Bolivar]; adapted from the teleplay by Hans Beimler, story by Louis P. DeSantis & Robert J. Bolivar. 62 · Broken Link [Star Trek] · John Sayers · sa [Robert Hewitt Wolfe; Ira Steven Behr; George A. Brozak]; adapted from the teleplay by Robert Hewitt Wolfe & Ira Steven Behr, story by George A. Brozak. 8 · Apocalypse Rising [Star Trek] · John Sayers · sa [Ira Steven Behr; Robert Hewitt Wolfe]; adapted from the teleplay by Ira Steven Behr & Robert Hewitt Wolfe. 16 · The Ship [Star Trek] · John Sayers · sa [Hans Beimler; Pam Wigginton; Rick Cason]; adapted from the teleplay by Hans Beimler, story by Pam Wigginton & Rick Cason. 51 · Looking for parMach in All the Wrong Places [Star Trek] · John Sayers · sa [Ronald D. Moore]; adapted from the teleplay by Ronald D. Moore. 58 · Nor the Battle to the Strong [Star Trek] · John Sayers · sa [René Echevarria; Brice R. Parker]; adapted from the teleplay by René Echevarria, story by Brice R. Parker. 7 · The Assignment [Star Trek] · John Sayers · sa [David Weddle; Bradley Thompson; David R. Long; Robert Lederman]; adapted from the teleplay by David Weddle & Bradley Thompson, story by David R. Long & Robert Lederman. 20 · Trials and Tribble-ations [Star Trek] · John Sayers · sa [Ronald D. Moore; René Echevarria; Ira Steven Behr; Hans Beimler; Robert Hewitt Wolfe]; adapted from the teleplay by Ronald D. Moore & René Echevarria, story by Ira Steven Behr & Hans Beimler & Robert Hewitt Wolfe. 43 · Let He Who Is Without Sin... [Star Trek] · John Sayers · sa [Robert Hewitt Wolfe; Ira Steven Behr]; adapted from the teleplay by Robert Hewitt Wolfe & Ira Steven Behr. 48 · Things Past [Star Trek] · John Sayers · sa [Michael Taylor]; adapted from the teleplay by Michael Taylor. 53 · The Ascent [Star Trek] · John Sayers · sa [Ira Steven Behr; Robert Hewitt Wolfe]; adapted from the teleplay by Ira Steven Behr & Robert Hewitt Wolfe. 58 · Rapture [Star Trek] · John Sayers · sa [Hans Beimler; L. J. Strom]; adapted from the teleplay by Hans Beimler, story by L. J. Strom. 62 · The Darkness and the Light [Star Trek] · John Sayers · sa [Ronald D. Moore; Bryan Fuller]; adapted from the teleplay by Ronald D. Moore, story by Bryan Fuller. 8 · The Begotten [Star Trek] · John Sayers · sa [René Echevarria]; adapted from the teleplay by René Echevarria. 12 · For the Uniform [Star Trek] · John Sayers · sa [Peter Allan Fields]; adapted from the teleplay by Peter Allan Fields. 44 · In Purgatorys Shadow [Star Trek] · John Sayers · sa [Robert Hewitt Wolfe; Ira Steven Behr]; adapted from the teleplay by Robert Hewitt Wolfe & Ira Steven Behr. 48 · By Infernos Light [Star Trek] · John Sayers · sa [Ira Steven Behr; Robert Hewitt Wolfe]; adapted from the teleplay by Ira Steven Behr & Robert Hewitt Wolfe. 64 · Doctor Bashir, I Presume [Star Trek] · John Sayers · sa [Ronald D. Moore; Jimmy Diggs]; adapted from the teleplay by Ronald D. Moore, story by Jimmy Diggs. 10 · A Simple Investigation [Star Trek] · John Sayers · sa [René Echevarria]; adapted from the teleplay by René Echevarria. 27 · Business as Usual [Star Trek] · John Sayers · sa [Bradley Thompson; David Weddle]; adapted from the teleplay by Bradley Thompson & David Weddle. 44 · Ties of Blood & Water [Star Trek] · John Sayers · sa [Robert Hewitt Wolfe; Edmund Newton; Robbin L. Slocum]; adapted from the teleplay by Robert Hewitt Wolfe, story by Edmund Newton & Robbin L. Slocum. 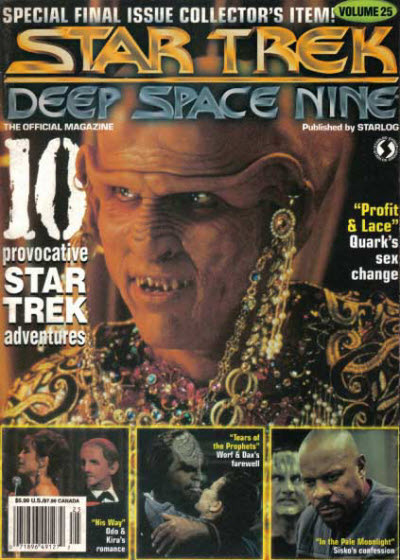 60 · Ferengi Love Songs [Star Trek] · John Sayers · sa [Ira Steven Behr; Hans Beimler]; adapted from the teleplay by Ira Steven Behr & Hans Beimler. 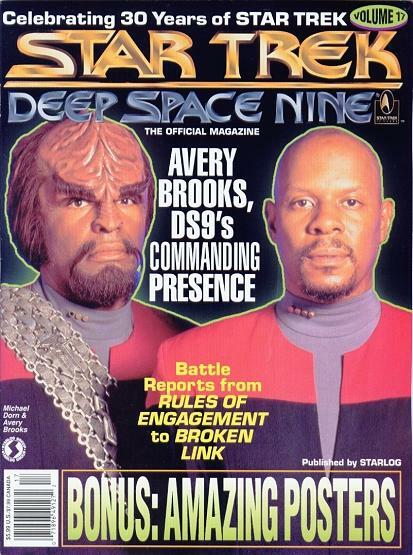 64 · Soldiers of the Empire [Star Trek] · John Sayers · sa [Ronald D. Moore]; adapted from the teleplay by Ronald D. Moore. 12 · Children of Time [Star Trek] · John Sayers · sa [René Echevarria; Gary Holland; Ethan H. Calk]; adapted from the teleplay by René Echevarria, story by Gary Holland & Ethan H. Calk. 16 · Blaze of Glory [Star Trek] · John Sayers · sa [Robert Hewitt Wolfe; Ira Steven Behr]; adapted from the teleplay by Robert Hewitt Wolfe & Ira Steven Behr. 27 · Empok Nor [Star Trek] · John Sayers · sa [Hans Beimler; Bryan Fuller]; adapted from the teleplay by Hans Beimler, story by Bryan Fuller. 32 · In the Cards [Star Trek] · John Sayers · sa [Ronald D. Moore; Truly Barr Clark; Scott J. Neal]; adapted from the teleplay by Ronald D. Moore, story by Truly Barr Clark & Scott J. Neal. 43 · Call to Arms [Star Trek] · John Sayers · sa [Ira Steven Behr; Robert Hewitt Wolfe]; adapted from the teleplay by Ira Steven Behr & Robert Hewitt Wolfe. 8 · A Time to Stand [Star Trek] · John Sayers · sa [Ira Steven Behr; Hans Beimler]; adapted from the teleplay by Ira Steven Behr & Hans Beimler. 13 · Rocks & Shoals [Star Trek] · John Sayers · sa [Ronald D. Moore]; adapted from the teleplay by Ronald D. Moore. 17 · Sons & Daughters [Star Trek] · John Sayers · sa [Bradley Thompson; David Weddle]; adapted from the teleplay by Bradley Thomson & David Weddle. 27 · Behind the Lines [Star Trek] · John Sayers · sa [René Echevarria]; adapted from the teleplay by René Echevarria. 32 · Favor the Bold (Part 1) [Star Trek] · John Sayers · sa [Ira Steven Behr; Hans Beimler]; adapted from the teleplay by Ira Steven Behr & Hans Beimler. 36 · Sacrifice of Angels (Part 2) [Star Trek] · John Sayers · sa [Ira Steven Behr; Hans Beimler]; adapted from the teleplay by Ira Steven Behr & Hans Beimler. 43 · You Are Cordially Invited... [Star Trek] · John Sayers · sa [Ronald D. Moore]; adapted from the teleplay by Ronald D. Moore. 49 · Resurrection [Star Trek] · John Sayers · sa [Michael Taylor]; adapted from the teleplay by Michael Taylor. 60 · Statistical Probabilities [Star Trek] · John Sayers · sa [René Echevarria; Pam Pietroforte]; adapted from the teleplay by René Echevarria, story by Pam Pietroforte. 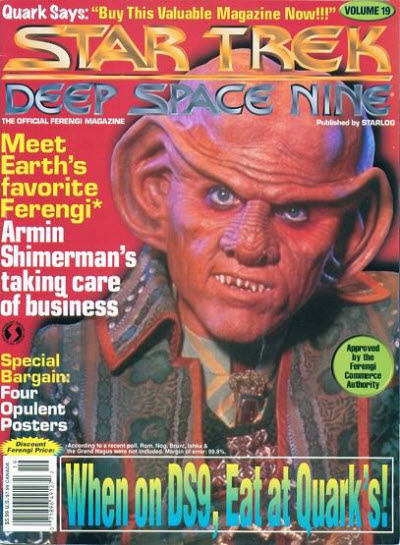 65 · The Magnificent Ferengi [Star Trek] · John Sayers · sa [Ira Steven Behr; Hans Beimler]; adapted from the teleplay by Ira Steven Behr & Hans Beimler. 8 · Waltz [Star Trek] · John Sayers · sa [Ronald D. Moore]; adapted from the teleplay by Ronald D. Moore. 17 · Who Mourns for Morn? [Star Trek] · John Sayers · sa [Mark Gehred-OConnell]; adapted from the teleplay by Mark Gehred-OConnell. 27 · Far Beyond the Stars [Star Trek] · John Sayers · sa [Ira Steven Behr; Hans Beimler; Marc Scott Zicree]; adapted from the teleplay by Ira Steven Behr & Hans Beimler, story by Marc Scott Zicree. 32 · One Little Ship [Star Trek] · John Sayers · sa [David Weddle; Bradley Thompson]; adapted from the teleplay by David Weddle & Bradley Thompson. 36 · Honor Among Thieves [Star Trek] · John Sayers · sa [René Echevarria; Philip Kim]; adapted from the teleplay by René Echevarria, story by Philip Kim. 61 · Change of Heart [Star Trek] · John Sayers · sa [Ronald D. Moore]; adapted from the teleplay by Ronald D. Moore. 9 · Wrongs Darker Than Death or Night [Star Trek] · John Sayers · sa [Ira Steven Behr; Hans Beimler]; adapted from the teleplay by Ira Steven Behr & Hans Beimler. 12 · Inquisition [Star Trek] · John Sayers · sa [Bradley Thompson; David Weddle]; adapted from the teleplay by Bradley Thompson & David Weddle. 16 · In the Pale Moonlight [Star Trek] · John Sayers · sa [Michael Taylor; Peter Allan Fields]; adapted from the teleplay by Michael Taylor, story by Peter Allan Fields. 27 · His Way [Star Trek] · John Sayers · sa [Ira Steven Behr; Hans Beimler]; adapted from the teleplay by Ira Steven Behr & Hans Beimler. 32 · The Reckoning [Star Trek] · John Sayers · sa [David Weddle; Bradley Thompson; Harry M. Werksman; Gabrielle Stanton]; adapted from the teleplay by David Weddle & Bradley Thompson, story by Harry M. Werksman & Gabrielle Stanton. 36 · Valiant [Star Trek] · John Sayers · sa [Ronald D. Moore]; adapted from the teleplay by Ronald D. Moore. 43 · Profit & Lace [Star Trek] · John Sayers · sa [Ira Steven Behr; Hans Beimler]; adapted from the teleplay by Ira Steven Behr & Hans Beimler. 48 · Times Orphan [Star Trek] · John Sayers · sa [Bradley Thompson; David Weddle; Joe Menosky]; adapted from the teleplay by Bradley Thompson & David Weddle, story by Joe Menosky. 59 · The Sound of Her Voice [Star Trek] · John Sayers · sa [Ronald D. Moore; Pam Pietroforte]; adapted from the teleplay by Ronald D. Moore, story by Pam Pietroforte. 66 · Tears of the Prophets [Star Trek] · John Sayers · sa [Ira Steven Behr; Hans Beimler]; adapted from the teleplay by Ira Steven Behr & Hans Beimler. 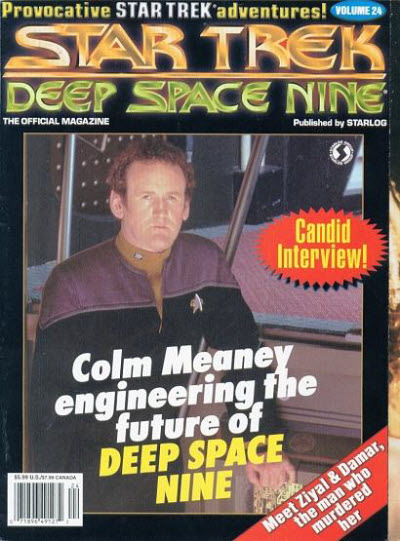 Largely filled with articles about the cast, characters and other features of the second Star Trek series. 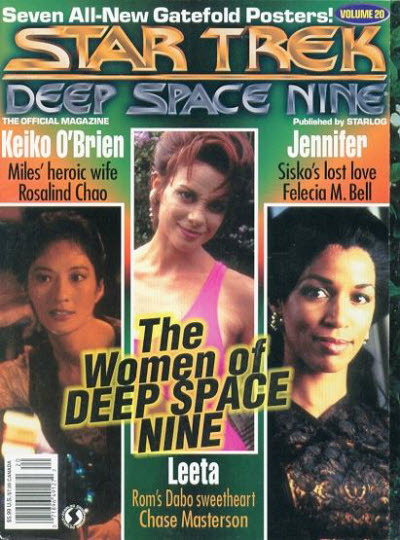 Most issues contain what are described as synopses, which are brief prose adaptations of the shows scripts, analogous to the ones James Blish did for the original series. Apart from a handful of novelizations, these are the only prose adaptations that most espisodes ever had. 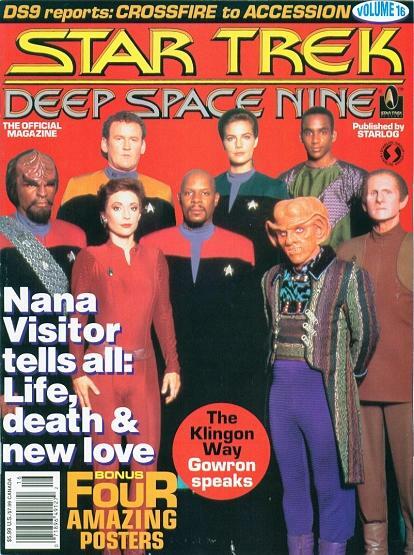 Although the number of stories per issue varied, all the episodes were eventually adapted. The existence of these adaptations seems not to be widely known outside of Trek fandom. 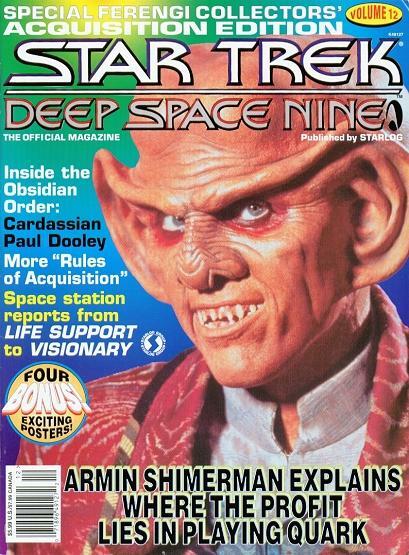 OQuinn Studios; New York: Star Trek: The Next Generation, Dec 1987  Jun 1989. 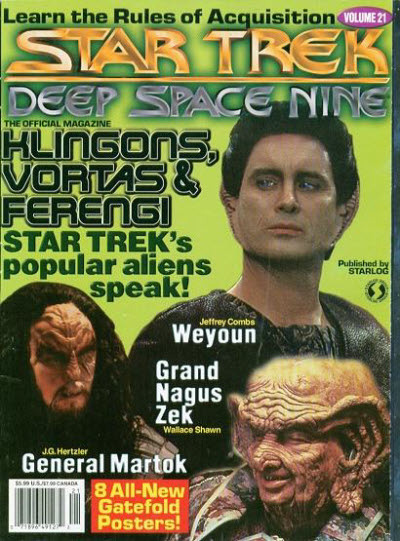 Starlog Communications International; New York: Star Trek: The Next Generation, Dec 1989  May 1990. 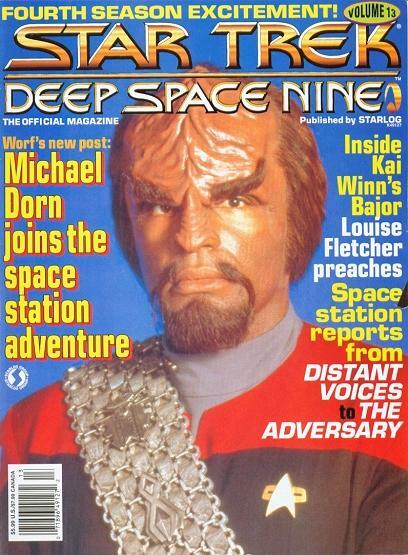 Carr DAngelo - Editor: Star Trek: The Next Generation, Dec 1987  Jan 1988.